The Geoblock® porous pavement system is used to create vegetated pavements when maximum load support and turf protection are required. The Geoblock® vegetated permeable paving system (Grass Pavers) is made from reprocessed plastics and provides a series of interlocking blocks which is ideal for use in moderate traffic areas where natural vegetation is desired. When aesthetics and permeability rival other considerations Geoblock® Grass Pavers provide the most dependable load support and cost-effective protection to turf. 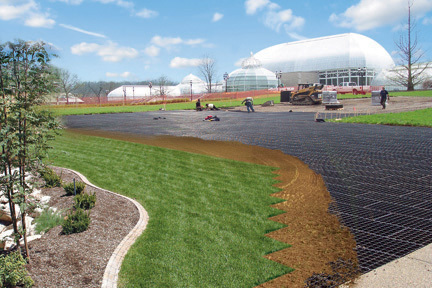 The Geoblock® cell is partially filled with soil and then seeded or sodded with grass. The high-strength cell structure and engineered base carry the traffic loads while protecting the grass from damage or soil compaction. Geoblock® Grass Pavers are ideal for occasional use vegetated fire lanes, golf course pathways, auxiliary parking lots and trails in recreational areas. AirDrain® is the innovative, ecologically sound solution for porous paving and erosion control. FilterPave is a porous pavement which uses recycled coloured glass aggregate to allow for infiltration of stormwater. The GeoPave® system is a permeable pavement designed to handle normal traffic up to H-20 loading and doubles as a storm water retention system.